It’s strange the nonsense that can pop into your head, but the first reaction my brain had to the vision of the ruddy volcanic cone rising above a strip of pale golden sand was to play Bali Ha’i from the musical South Pacific. Okay, geographically I was way off base as the island directly in front of the prow of the boat was La Graciosa and it sits in the Atlantic just off the coast of Lanzarote near Africa. 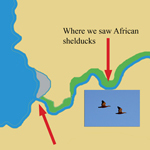 But in many ways it fitted my image of a bona fide desert island. Especially the desert part as there didn’t seem to be any trees anywhere – only sand, sand and more sand. As we drew closer the sea changed from being electric blue to DayGlo turquoise. I’ve never seen sea that colour in the Canary Islands before. 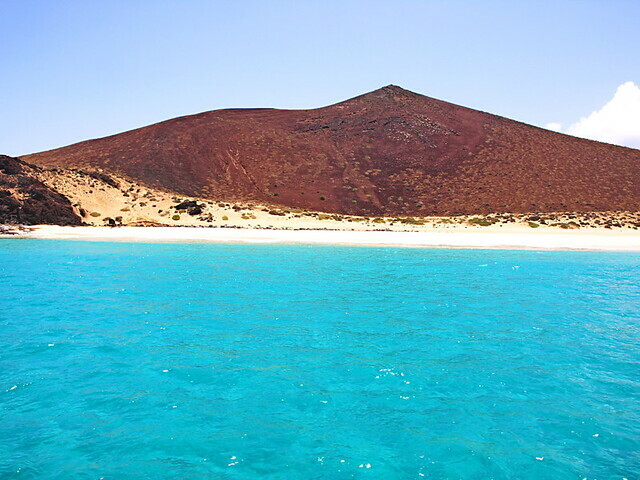 La Graciosa looked as though it had been picked up by some giant hand and relocated to this part of the world. It just doesn’t seem to fit in with the islands around it. We transferred to a small Zodiac and glided through the turquoise waters to embark a few feet from the water’s edge and paddle the rest of the way. I was still hypnotised by the intense colour of the water and half expected the lower half of my leg to be blue when I stepped onto the soft gold sand. This was no deserted, desert island though. 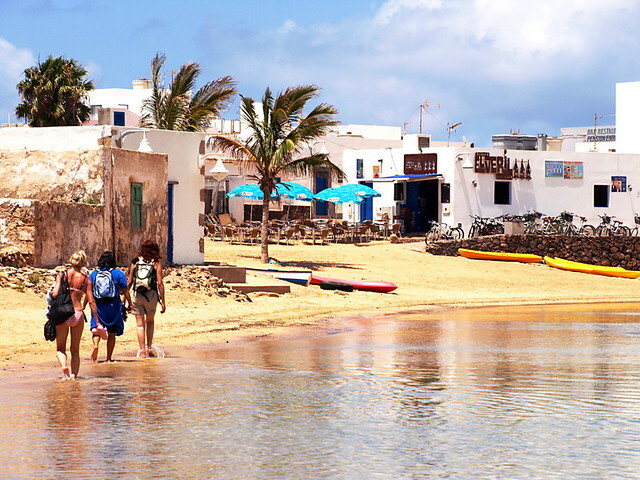 Although still unknown by the masses, La Graciosa is visited by boat trips daily and Canarios make the trip from the bigger islands to enjoy the sun in serene surroundings. There were a couple of people already prone on the soft sand, topping up full body tans. Clothes on these quiet beaches are optional and even wearing a T-shirt and shorts felt like sporting a tux and DJ at a toga party. You can understand why people get naked on beaches on La Graciosa; it’s the sort of location where clothes seem an unwanted reminder of the materialistic world outside; a place where nature should be experienced completely in the raw. Plus it’s damn hot and the desire to rip off every bit of clothing and plunge back into those delicious waters is almost overwhelming. But going naked on Graciosa wasn’t an option. Where others in our group had chosen to kayak their way to the main town at Caleta del Sebo, we had opted to hike. After a half hour of sitting on the beach transfixed by the vista, we set off along a sandy (what else) track. Whilst the idea of a desert island conjures up all sorts of romantic notions, the reality of walking on one is quite different. Under clear blue skies and with the temperatures topping 30C, the complete lack of shade soon turns what would be a pleasant hour-long walk into a foreign legion route march. But the spectacular setting helped distract from the overpowering heat. Along the way Carmen, our guide, pointed out thousands of small, cylindrical objects in the sand; they were bee fossils or more accurately, something called brood cells. 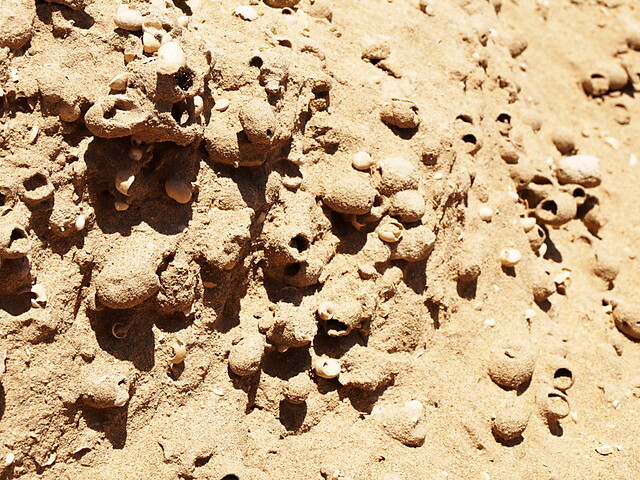 Once you spot them, you can see that the place is covered with fossils, even some of the sandy rock formations are made up from these hard little brood cells. If their residents were still around I’m not so sure that people would be quite so keen to expose their white bits. The path continued past more idyllic coves and cooling pools until in front of us we spotted civilisation … such as it was. There are only around 500 people living on La Graciosa. You wonder how they can make a living in this beautiful, but barren place. Carmen tells us that people are encouraged by the government to stay and carry on with a traditional lifestyle. Basically people are paid to live on this paradise island and fish. There are worse ways to exist that’s for sure. La Graciosa confounds all expectations of what constitutes a Canary Island, even the approach to the town is unconventional. The water almost reaches up to the doors of some houses and we had to remove our sandals to wade through pools in parts. The town looked as though it belonged in the Sahara, there are streets, but the roads are all sand. There are a few cars, but they are all old Landrovers. 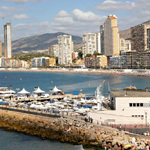 It is a beautiful, enchanting place; a place that leaves you in no doubt as to where you are – very close to North Africa. The handful of cafés and restaurants dotted around the harbour were a very welcome sight for two reasons – shade and refreshment. We had just about enough time for lunch and a glass or two of vino before it was time to catch the boat back to Lanzarote. 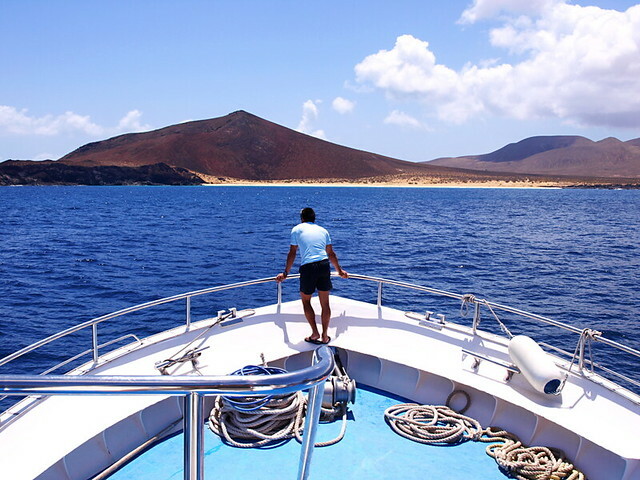 Boats ferry visitors daily from Orzola but La Graciosa doesn’t feel compromised by tourism. 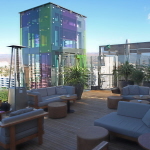 It’s a wonderful little island and visiting offers a very different Canary Island experience. We vowed to return and stay for a couple of nights next time, travelling light of course – we know we won’t need a lot of clothes. 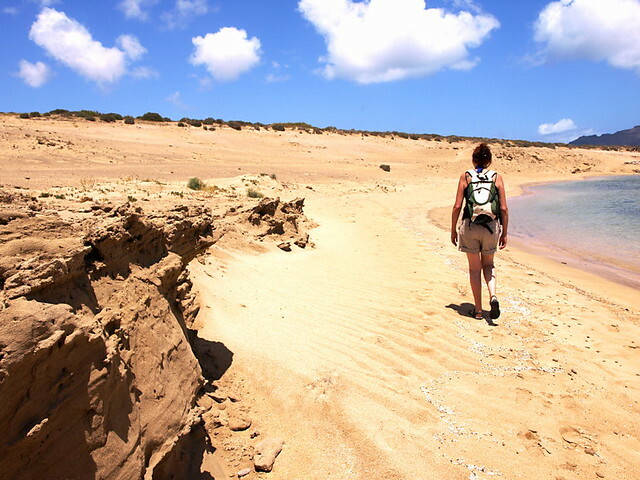 Buzz Trips Facts: We travelled to La Graciosa as guests of Lanzarote Active Club. 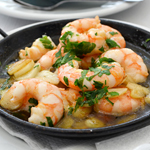 We’d recommend them to anyone planning this excursion. Not only did we have a brilliant trip, all the guides were knowledgeable and committed to ensuring that people have as much an educational experience as an enjoyable one. They are also passionate about protecting the environment. The trip also involved a visit to neighbouring Alegranza and costs €65 per person (lunch, kayaking, transport all included). La Graciosa is just astonishing. 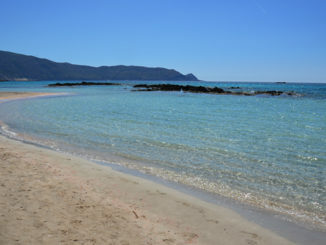 Completely unspoiled, nothing man-made in sight out of the small village of Caleta del Sebo. You can feel as the last man in the world, surrounded only by sand, volcanoes and cristal clear waters. It can’t be closer to paradise (and if you dare, the perfect place to enjoy nudism).